Are you ready to take your Sunday school activities to the next level? Don't let boring, unimaginative or generic children's bulletins take the fun out of your Sunday school plans. Children's Worship Bulletins include Bible-based activities, quizzes, word searches, dot-to-dots, seek-and-finds and so many more activities that children love. In this short article, we show you how to create engaging, kid-friendly and fun Sunday school activities about Leah & Rachel using our bulletins. Try them to see how easy it is to take your Sunday school bulletins to the next level! Read Genesis 29:15-28 aloud to the class. Ask the children what tools Jacob may have needed to work for Laban, prompting, if necessary, to get the children to list a pitchfork, shepherd's hook, pair of gloves, hammer and ladder. Explain the activity, "You've listed quite a few tools that Jacob would need to work for Laban. I've hidden five of these tools around the classroom. When I yell, 'GO!' work together as a team to find all five of them. When you find one of the tools, pull it from its hiding place. The team who finds all five tools first wins!" Yell, "GO!" and allow the children to find the hidden tools. Award prizes to the team that finds all five tools first. Give each child a bulletin, some crayons or colored pencils, a pair of scissors and an envelope. Explain the activity, "Today, we're going to solve one puzzle and make another! While I read our Bible story, please solve the puzzle 'Jacob was working for Laban' by completing the right sides of the drawings of Leah and Rachel. Then, color the picture of each woman." Allow the children to solve the puzzle and color the pictures while you read Genesis 29:15-28 aloud to the class. After you have finished the story, and the children have solved and colored their pictures, explain, "Now, carefully cut out the squares along the dotted lines to make 48 puzzle pieces. Put all of your puzzle pieces in your envelope. When you have finished, we'll exchange puzzles. Then, see if you can solve your classmate's puzzle!" Allow the children to cut their pictures into squares and to put their pieces into envelopes. Help the children exchange their puzzles with a classmate. Allow the children to solve their classmates' puzzles. Why not have personalized unique and fun bulletins to give to the children in your church? With Children's Worship Bulletins, you can customize bulletins before you print them. We make it easy for you to include your church's name, website or any other contact information you wish. You can even include a church logo or image. 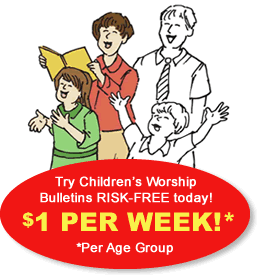 A membership to Children's Worship Bulletins includes unlimited access to our enormous online library of bulletins. Choose bulletins by theme, lectionary or Scripture verse to match the pastor's sermon, celebrate a specific holiday or study an important Bible story. With a membership, all of our creative and fun bulletins are available with the click of the mouse!